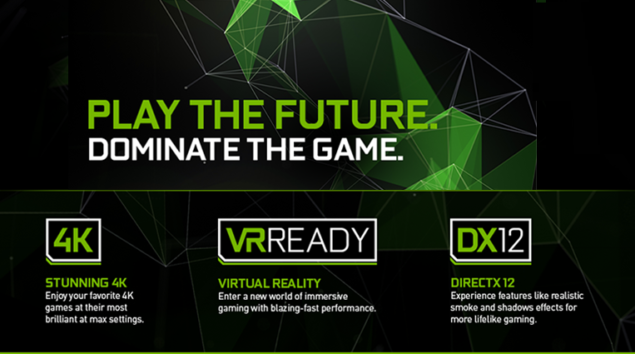 NVIDIA is prepping their next generation Pascal GPUs for consumers which will be featured on their upcoming GeForce graphics cards. The GPU to power such graphics cards will be known as the Pascal GP104 which will be built on the same 16nm process node as the GP100 which is first going in servers. 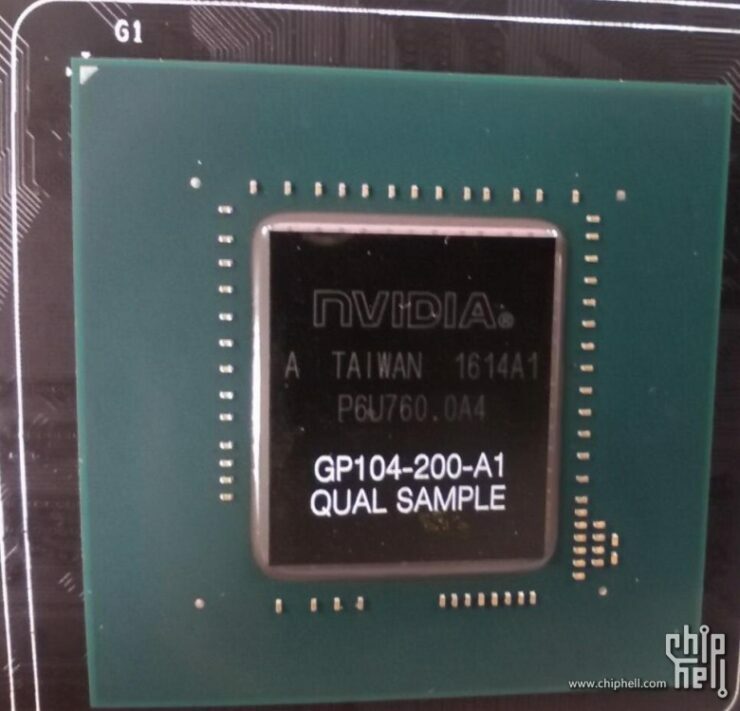 We saw the first pictures of Pascal GP104 a few weeks back but now we have gotten a much closer look at the upcoming gaming grade chip from NVIDIA. The latest shots of the Pascal GP104 GPU are leaked by Videocardz with much more detail than the previous shot. This picture also reveals some additional details such as the card is no longer in engineering state but in qualification state (QS) which means that NVIDIA and their AIB partners are ready to unveil this card relatively soon. 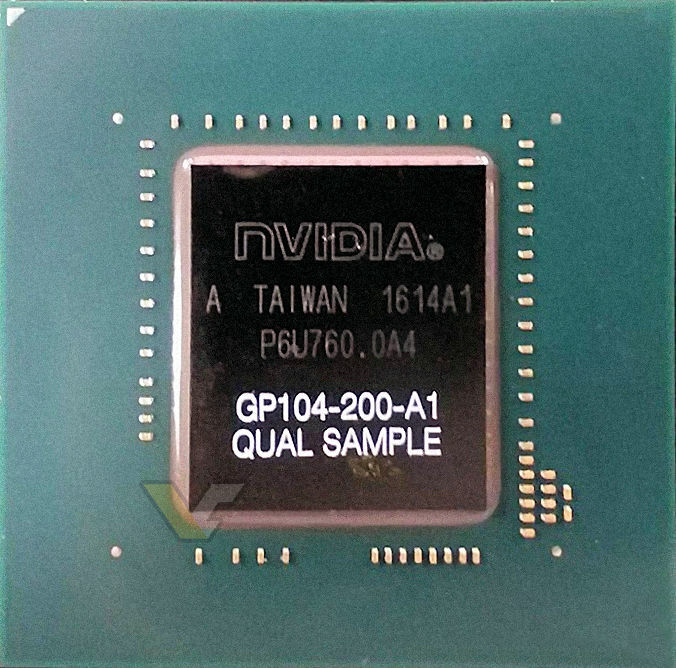 A few things to note about this leak is that the last time we saw the GP104 GPU, it was housed on a green PCB which is used internally by NVIDIA to test the chip when it is under engineering phase. The chip is now past the phase and ready for qualification hence we see a black PCB which means that the GPU is finally doing the round on a retail ready board. The NVIDIA Pascal GP104 GPU Will Be The Heart of Next-Gen GeForce Cards! Coming to the talk on the die, the GP104 measures at approximately 317mm2 which is smaller than both the GM200 and GM204 GPUs. Just to put things in perspective, NVIDIA’s current Titan X has 8 Billion transistors on a 601mm2 die. 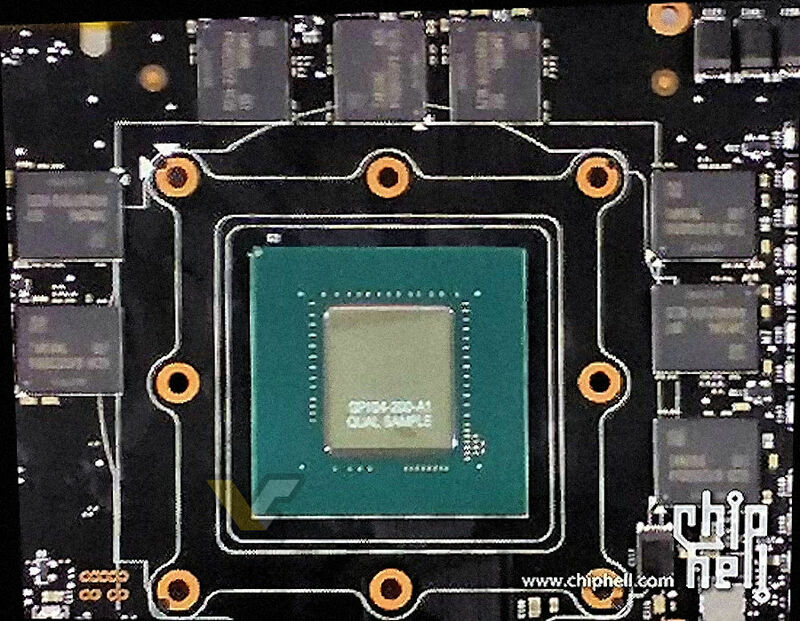 The GeForce GTX 980 with GM204 on the other hand is a 398mm2 die with a total of 5.2 billion transistors. FinFET really proves to be a miracle when it comes to increasing the overall transistor numbers and at the same time, decreasing the chip size. This allows more chips to be manufacturerd on a 16nm Wafer that saves cost for NVIDIA developing such GPUs. A GPU die comparison of GM200, GM204 and GP104 Posted by Videocardz. Rest of the board was not pictured but the specific SKU was pictured with a total of eight 8 Gbps memory chips featuring 8 Gb density. The board uses the latest Samsung K4G80325FB-HC25 chips which use the 8 Gb DRAM and run at 8 Gbps speeds. This will allow NVIDIA to boost not only the bandwidth but also the VRAM size on their upcoming GeForce cards. We know that the GP104-200-A1 SKU will be featured on the GeForce GTX 1070 graphics card featuring GDDR5 memory while the GeForce GTX 1080 graphics card will feature GDDR5X memory. It is pointed that both GDDR5 and GDDR5X memory are not pin-to-pin compatible since GDDR5 uses a 170 pin ball grid while GDDR5X uses a 190 pin ball grid layout. Both cards feature the same amount of VRAM of 8 GB but 1080 will have higher total bandwidth available up to 384 GB/s while retaining a 256-bit memory bus. Memory bandwidth of around 256 GB/s on GeForce cards along a 256-bit interface is also workable since Gaming GPUs now include several memory compression technologies which conserve and run fine with the available bandwidth hence making sure that the bandwidth doesn’t become a bottleneck. We so far have not seen a case of extreme memory bandwidth bottlenecks on gaming cards. NVIDIA’s GeForce Pascal GPUs are ready to launch very soon. We have already seen several coolers leaked on the web along with the branding schemes. The GeForce GTX 1080 and GTX 1070 cards which will be using the Pascal GP104 GPUs are built for gamers in mind. The NVIDIA and AMD solutions will be designed to deliver lots of horse power to gamers while being efficient. 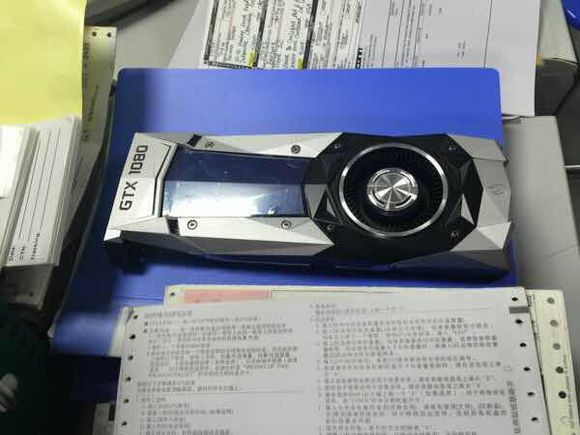 The leaked cooling shroud of the GeForce GTX 1080 gives us a decent look at the aggressive design. It seems like that 8 GB VRAM will become the standard for high performance graphics cards like the GeForce GTX 1080 and 1070. These graphics cards, fused with a range of new features will be aim to provide better graphics performance at high resolutions and in games that are built with DirectX 12 and Vulkan APIs and their respective technologies such as Compute Preemption. Before Pascal, on systems where compute and display tasks were run on the same GPU, long-running compute kernels could cause the OS and other visual applications to become unresponsive and non-interactive until the kernel timed out. Because of this, programmers had to either install a dedicated compute-only GPU or carefully code their applications around the limitations of prior GPUs, breaking up their workloads into smaller execution timeslices so they would not time out or be killed by the OS. Indeed, many applications do require long-running processes, and with Compute Preemption in Pascal, those applications can now run as long as they need when processing large datasets or waiting for specific conditions to occur, while visual applications remain smooth and interactive—but not at the expense of the programmer struggling to get code to run in small timeslices. NVIDIA’s Pascal GPUs are gearing to be the same revolution which was their Maxwell GPUs at the time of launch. The Maxwell GPUs launched back in 2014 and allowed NVIDIA to capture up to 80% of the discrete graphics market share. Competitive pricing on Pascal cards will allow many current and last generation GPU owners to upgrade to the Pascal GeForce cards which will deliver performance and efficiency increases along with better tech support for next-generation AAA titles.